Combine the ingredients in a medium bowl. Refrigerate at least 1 hour to allow the flavors to develop. Keep refrigerated in an airtight container for up to a week. 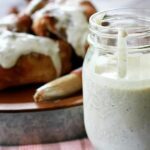 This sauce is perfect as a baste (just use near the end of cooking) or even as a dipping sauce for chicken, turkey, or pork. It's great on a pulled pork sandwich, too!